The family hits keep on coming early in the year, with a CGI animated blockbuster from Fox leading the way this weekend. Bruce Willis’s first action film in a couple of years is also in theaters, while a recut Passion of the Christ rounds out the debuts. In no other genre does the production company become so relevant as with animation, and especially computer animation. At the top, there’s Pixar, and then there’s everybody else, with the notable exception of DreamWorks’ Shrek films. Fox Animation probably comes a distant third, although Ice Age made a lot of money for being the blandest film ever, $176 million. The novelty of computer animation still seems to hold but may be fading, to judge by Shark Tale, which made $161 million, the lowest total for a CGI animation since the Antz/Bug’s Life combo in 1998. Or perhaps that’s the wrong way to put it, as the mere 3.4 times opening weekend that it earned showed that movie goers are starting to realize that all CGI is not created equal. It’s this environment that Robots opens into. Generic title aside, Robots looks to be a cut above the second tier of CGI, with a bright, rich look and oodles of design. Toying with the idea of a world entirely populated by mechanical beings, Robots is basically a classic coming-of-age adventure story. Ewan McGregor voices the lead among a big cast that includes Halle Berry, Drew Carey and Mel Brooks, but what’s really going to sell this film is the inclusion of Robin Williams, in full-on Aladdin mode. His manic energy has worked wonders for an animated film’s box office before, and it should happen again here. With a massive release at about 3,600 screens, Robots is aiming for big things this weekend. There’s a general absence of obviously lame jokes in the commercials, and it should easily win the weekend with a huge $55 million. 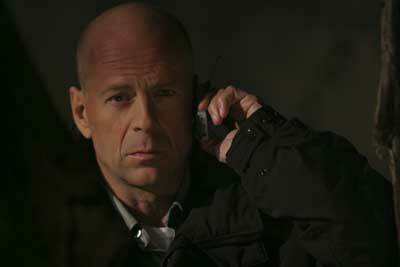 Hostage places Bruce Willis in a film that’s half Cop Land and half a reverse Panic Room. Retreating to a job as chief of police of a small California town after a botched hostage negotiation in Los Angeles, he’s faced with a crisis he never thought he would have again (this seems to happen a lot to his characters). A hostage situation in his sleepy little town of upper-class twits forces him back to negotiation, but this time, his family could be in danger. Honestly, I’m trying to think of something that makes this film look remarkable in any way, but it’s really just Bruce Willis Action Thriller #432. At least his last action film, Tears of the Sun, had the au courant “ethnic cleansing” angle to lean on. One potentially interesting item is that it is the English language directorial debut of Florent Siri, who is actually credited as the director of two Splinter Cell video games, though I’m guessing that has to be something to do with the cut scenes. Could he be the new Tarantino or Guy Ritchie? Well, probably not. But there’s always that chance, right? Hostage should come in at around $14 million for this weekend, and keep Bruce Willis in our collective consciousness until Sin City comes around. A less violent recut of Passion of the Christ hits a few hundred theatres this weekend, as Mel Gibson attempts to make the film a yearly tradition. Now, given Gibson’s statements about the film’s extreme violence being largely the point of the film, attempting to depict the extreme nature of the events, it seems to me that he is deliberately weakening the proposed message of his film just to make some bucks. That of course, is up to Gibson, but self-bowdlerization is still bowdlerization. At any rate, the inherent popularity of the film ($370 million!) is likely to spur some business this weekend, although certainly not to the same degree, as re-releases rarely set the world on fire. Give it $6 million for the weekend. This generation’s Kindergarten Cop, The Pacifier, returns as a surprise number one film. As an overgrown, gun-toting Mary Poppins, I suppose we could do worse than Vin Diesel, but you wonder if we really needed one in the first place. However, at $30 million on opening weekend, it’s an unqualified hit; the power of Disney marketing strikes again. Essentially review-proof at this point, this should keep cruising for a couple of weeks. Robots could be troubling to it, although CGI films definitely skew older these days. In its second weekend, it should pull in another $19 million or so. Be Cool turned the John Travolta doomsday clock back to nine minutes to midnight by opening to $23 million last weekend. This is in fact the highest opening for a Travolta film since Face/Off, though the $15-24 million range has been Travolta’s home turf for about a decade now. However, unlike the first film, Get Shorty, Be Cool is unlikely to have legs, as reaction has been more or less tepid to the film and as a sequel, it is apt to fade quickly. Look for around $13 million this weekend. Hitch’s decline in box office has increased every weekend since its open, as the romantic comedy has slowly worn out its welcome. At $140 million already, though, it is far and away the highest-grossing film of 2005 (for now). Its drop this weekend will take it to about $7 million, and very close to the $150 million milestone. Million Dollar Baby parlayed its Best Picture Oscar win into a status quo 11% increase over the previous weekend, and in keeping with virtually ever other Oscar winner that was still in theaters, kept its per-screen average steady. From here on begins the slow slide out of theatres, but a good haul is still in the works for Eastwood’s film. It should earn about $6 million this weekend. Though Diary of a Mad Black Woman was the surprise of the year so far, it was not able to keep the phenomenon going longer than one week, dropping almost 50% in weekend two. Though produced on a tiny budget and still certain to be extremely profitable, it is not going to be this year’s Big Fat Greek Wedding and appears to have little cross-over appeal. Give it $5-6 million over the next three days. The Upside of Anger is probably the highest profile of this weekend’s limited releases, owing to Kevin Costner and Joan Allen in lead roles. It’s a bit unusual candidate for such a release, but fits in the same category as last year’s Door in the Floor. It's a romantic melodrama about a woman and her daughters dealing with the disappearance of her husband, and a former Detroit Tigers pitcher that helps her recover. Owing to the Law of Costner, stating that all movies in which he plays a baseball player are good, this is probably a film to keep an eye on.